If you are all about home and family you have parked yourself in the right spot! We are Tamie and Trena; two sisters from Texas who love doing all the things that make our house a home. We are all about family, friends, decorating, cooking and entertaining. What we have learned through the years is that perfection isn’t important. What matters is the love and joy that comes from the effort. Life is short, and living to enjoy the moment is what we strive for. We don’t claim to throw the perfect party or cook the perfect meal but we do what we do out of the love of doing it and that seems to be what matters in the end. Somehow it just all works out successfully the way it is suppose to. We have found that even a perfectly burnt meal and the need to inadvertently serve guests delivered pizza is far from a failure. The laughter created is certainly better than the perfectly cooked dinner would have been! If you like to decorate, Trena can show you how to do it on a budget. Her specialty, “Garage Sale Decorating“, is about more than making a room beautiful on a budget. It is about appreciating imperfection and giving value to items that transcend time through daily use in another’s life. When you incorporate something old and discarded into your decor and cherish it in a new way, it brings about a sense of timelessness and restoration into your home. It is a reminder that old and used is just a matter of perspective! If you love to cook, it is said that Tamie can throw a gourmet meal together out of a package of wieners and a jar of pickles. Problem is she never remembers how she made that delicious dish! If you want to know how she did it, you better write it down fast. We are going to attempt to publish all her wonderful dishes on this website before she forgets how she made them. As far as entertaining, Tamie makes an event even out of just having a few girls over to watch a movie! And one of Trena’s most cherished times is cooking for friends and family with her husband Danny! 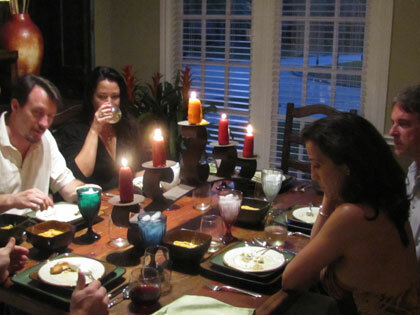 So we invite you into our homes to share with us some of the moments that make our lives fun and memorable. Family and friends are the center of our lives and we welcome you into our little circle. We hope you will share with us what rocks your world because we want to know what you know about making your house a home. Email us and let us hear!